On Thursday, Jonathan got his card from Grandma with two five dollars to get the Spiderman potato head he'd been admiring. So on Friday morning we headed to Target pretty early. We looked and looked, and we asked the workers who were rearranging the Easter stuff, but we never found one. We had a sad little boy for a few minutes. But... when Tonya got here, of course, she had to stop by Target with Jonathan, and she just happened to find one last Spiderman in all the chaos. He was excited to find out that it would only take one of his five dollars since it was after Easter. He's learning. Then we made the mistake of letting Tonya and Jonathan stop by another Target. 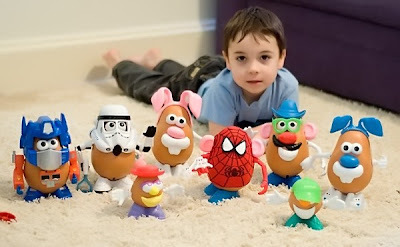 By the time they left, the potato head collection had multiplied quite a bit. They found a bunny and a whole potato bucket with two bigs and two littles. Hence the giant potato family you see here. The potato heads have been pretty mixed up, but this morning Jonathan made sure they found their proper outfits once again. He's pretty proud of them. I'm afraid we have a natural collector on our hands. First it was trains, then Cars from the movie, and now we have potato heads. Anyone want to volunteer to help us find space for his collections? I love the collection. Way to go Jonathan!!! I am glad you found a deal. Hopefully I can play with you soon. Great pic and I love the collection!